I’ve probably made some old Tory very happy today; I got on my bike in search of work. Specifically, hunting down empty shops to use in Shoreham-by-Sea. 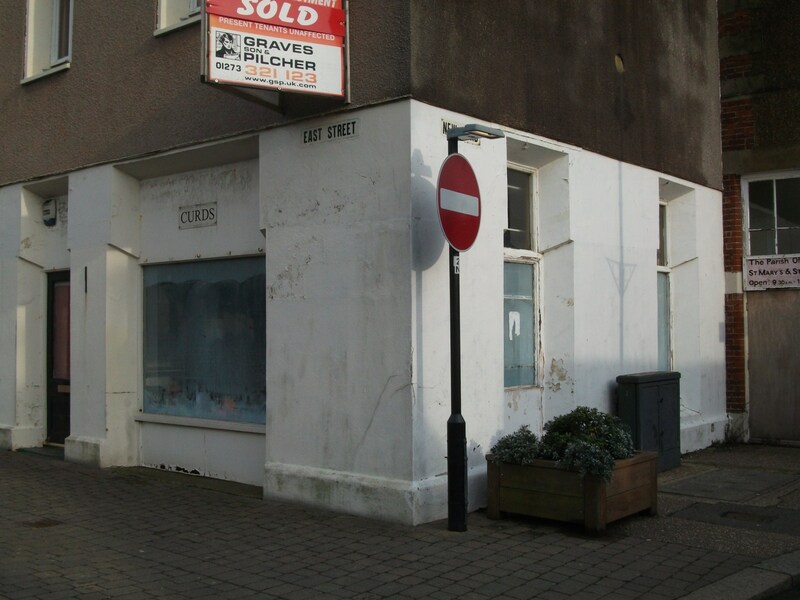 In the Empty Shops Network’s home town of Worthing, the Borough Council has forged a partnership with neighbouring Adur District Council, which means that our empty shops money covers Worthing, Lancing, Shoreham and Fishersgate. And we’re looking for a big, flagship project in Adur, so I’ve spent the day cycling to find likely sites. I was actually born in Shoreham, in the maternity unit in the old workhouse. I’ve worked there a lot, as a founder member of the Beach Dreams festival and as sound man for Richard Durrant. 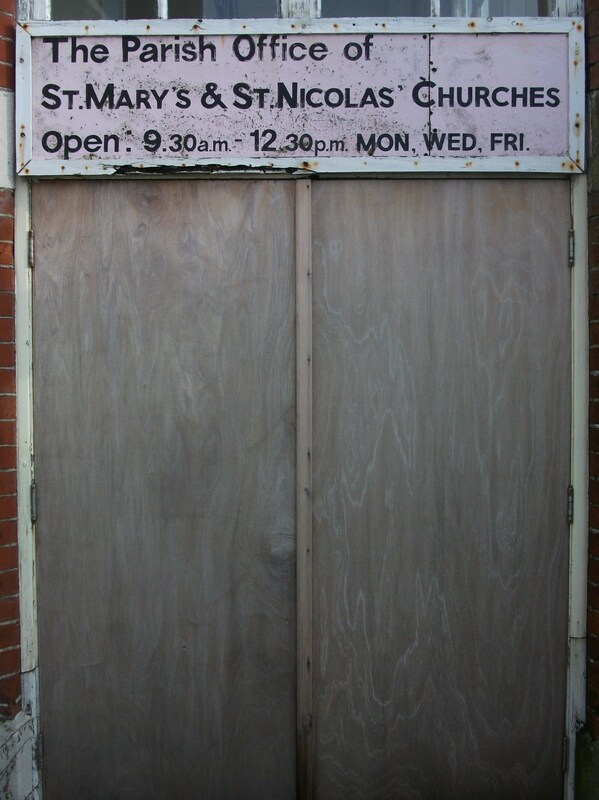 I’ve exhibited in, got married at, and floodlit the outside of, the Church of the Good Shepherd on Shoreham Beach – and once, notably, heard the Vicar’s confession. I lived on Shoreham High Street, in a flat above a charity shop, with views across the mudflats towards the houseboats. And I partied quite hard on the houseboats a few times, too. So I know Shoreham well, and it’s sad to see it suffering. There are a few empty shops, and a downmarket Woolworths clone in the old Woolworths. In a small town, those few empty shops really have an impact. Saddest of all, though, is a monumental building in the middle of historic Shoreham town, which looks like it’s been bought for redevelopment. It’s an odd bit of architecture, vaguely arts and crafts-ish; striped brickwork, odd detailing, hints of turrets and towers. There are four shops at street level, and the front two facing onto the old war memorial and church yard are suspiciously bunker-like with thick walls and small windows (pictured). One of them’s empty. Behind them, down a side street, are two more shop units, both more traditional but in poor condition. Both of these are empty. Above it all is the old church hall and parish offices, and from the state of the building and the boarded-up doors I’d guess these are empty, too. I’m not sure what the plans for this quirky architectural oddity are, but I’d like to find out more about the building – and I’ve got a site visit later this week to start exploring and planning. Can we bring a bit of temporary use to Shoreham town centre, perhaps some community shenanigans like The UpMarket project we ran in Worthing? It would sit well amongst the great little independents, scattering of cafes and delis, and a flea market in the old Tarmount Studios – all of which make Shoreham well worth a visit. Previous Post Worthing vs Lewes – what makes small towns tick? Dan – let me know how you get on. Am currently working out of a studio in Lancing industrial estate, but would love to be working and exhibiting back in shoreham. I exhibited at Allied Carpets in Worthing just before christmas – I was the seascapes! Let me know if you need any help, of if I can spread the word. Also am currently looking for someone to host me for the Adur Art trail, as my flat is in Lancing. Do you know of anyone? Hi – my partner is looking to share some studio space 2 days a week – he’s just starting out. Can you tell me how this works? Sorry – just found your site and I’m a bit clueless.